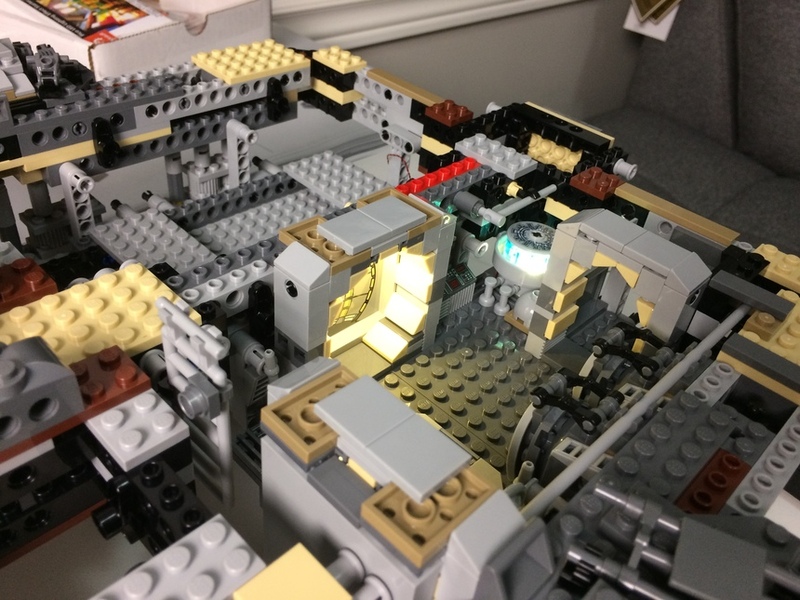 We've received many questions about our plans for a lighting kit for the beautiful new Millennium Falcon (LEGO set #75192). 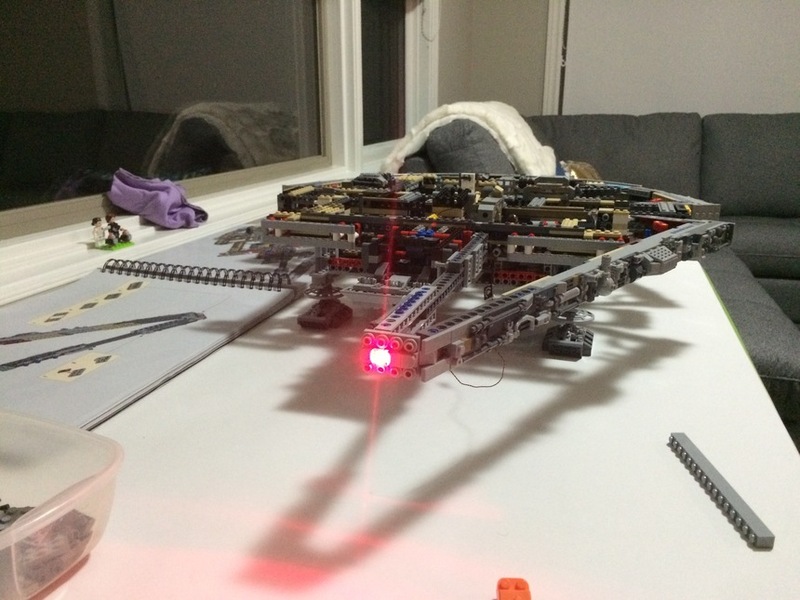 We have developed a kit for this model that includes not only lights, but SOUND as well. Plenty of photos, videos (with sound!) and detail about this amazing kit. 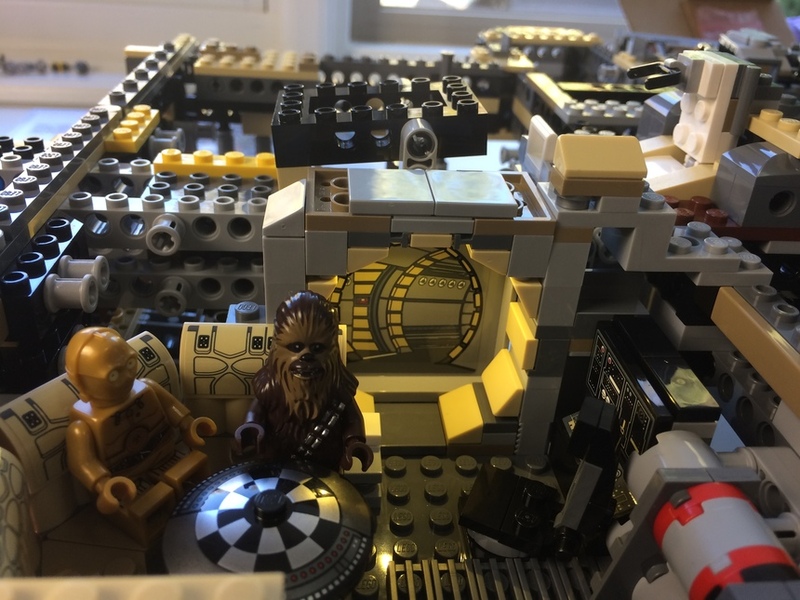 I'm starting this new Forum post so anyone out there who either has the set or who has ideas about what they'd like to see in a lighting and sound kit can let us know. We're still early in the process, so make your voice known! 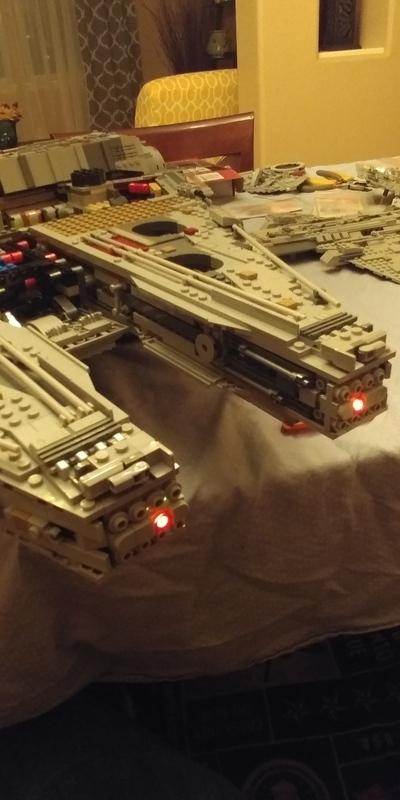 I added a pico red light at the front of the falcon, I had to change the round flat red brick for a round red translucent brick with a stud so the pico light fits under. First, totally awesome. 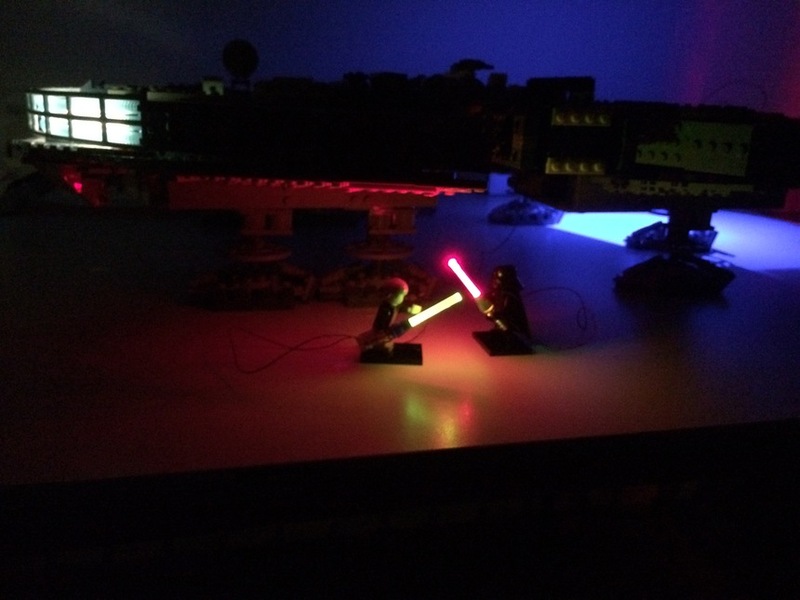 The build with the lights. 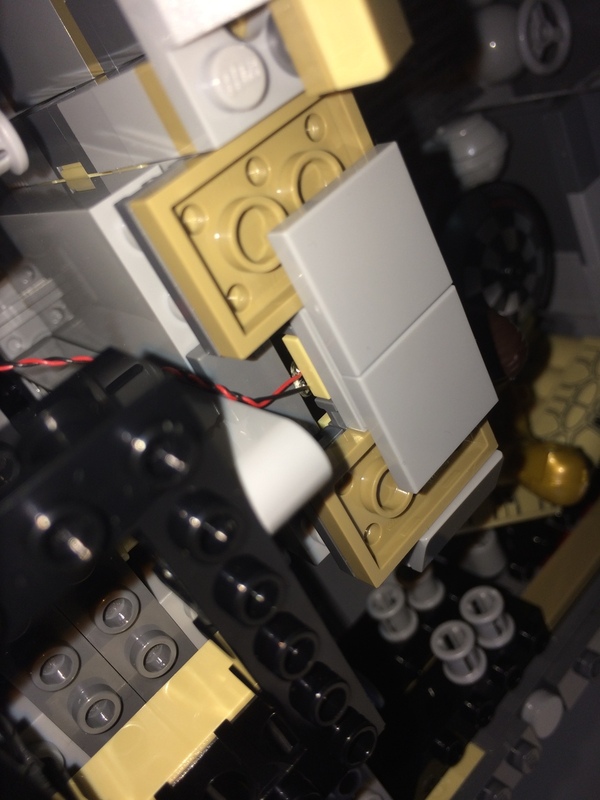 As much as I try to be a Brickstuff purist -- and not a Falcon owner -- I didn't realize the rear was blue tubing. *If* you're flirting with options, what about using EL-wire? I know it's low voltage, though yeah, wouldn't be part of the same power supply or controller, but it comes in skinny, neon-tube sort of stuff and has that neat bluish glow. do you have any picture of an EL wire ? Not sure what it is. i just googled it. 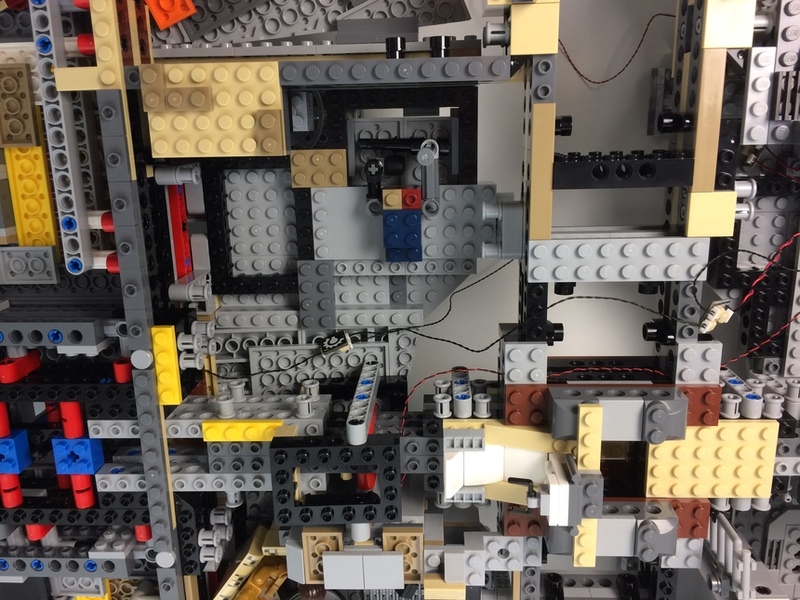 I think it would be hard as there are 6 blue tube in the Lego set. They are separated in the middle and it would be hard to insert the eL wire between the tube and connector to fit in the tube. 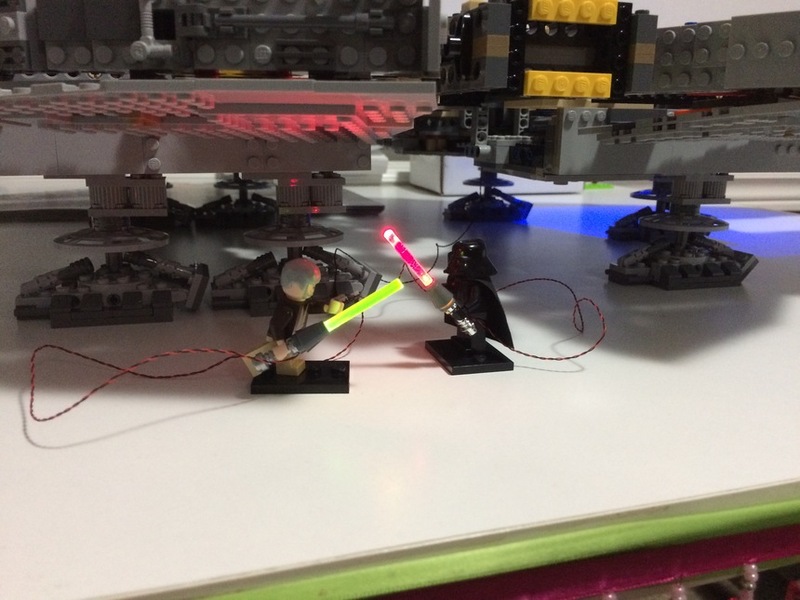 If you open the video I posted, you will see the look when using the led strip that I used with the jet engine effect. I will put lights underneath. 4 in the 4 holes at the front like on the picture, one in the ramp and one in the lower turret and probably a few at the back of the ship. This trial is a blue pico LED. I am thinking to put instead ultraviolet LED. What is your suggestions? also thinking about blue light (or ultraviolet for the cockpit)? Christian Nanini thank you so much for sharing your progress-- amazing work! Since we don't (yet) have one of these kits to work with ourselves, watching your work is great and very helpful as we refine our own design for a kit. 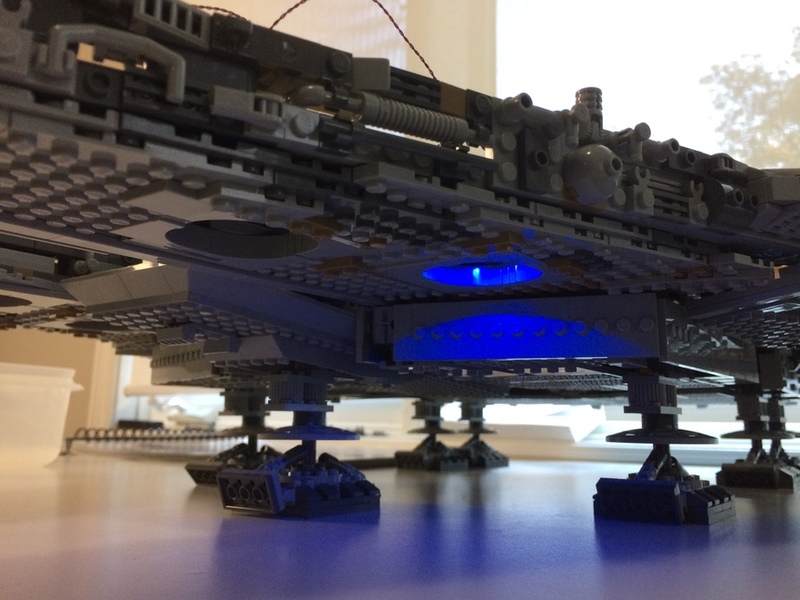 As for the question of whether to use blue or UV lights for the underside of the ship, I'd recommend sticking with the blue LED. 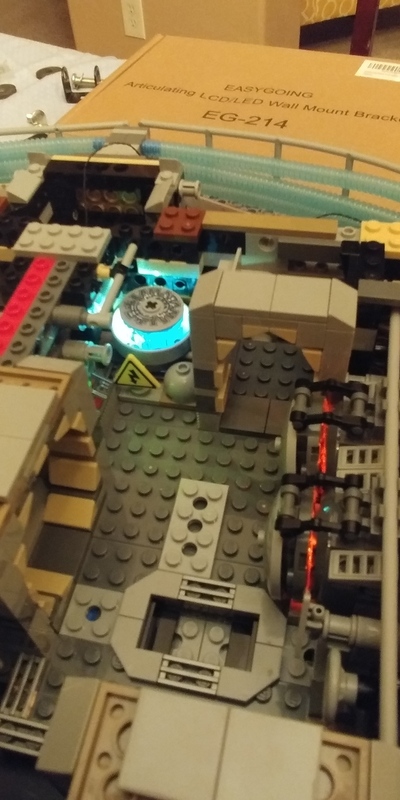 The UV LEDs aren't easy to see unless they are shining on plastic that glows in the dark (like pieces from the LEGO space sets), so if you had UV lights there, you wouldn't be able to see them as easily as the blue. 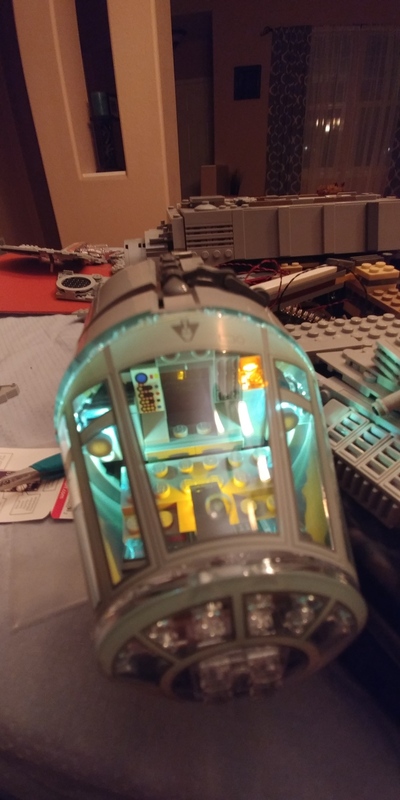 For the cockpit, a blue light would work well also-- unless there are parts inside the cockpit that glow in the dark (then a UV LED would work). 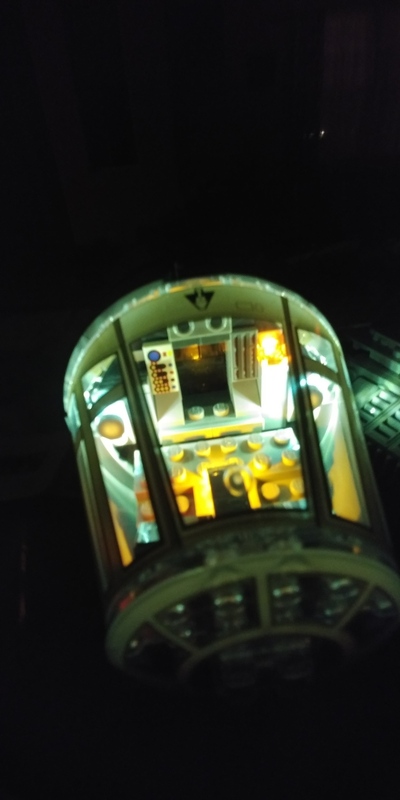 You might also think about putting a flashing Pico LED somewhere in the cockpit to simulate a console panel. I know there are others on the Internet who are considering using EL wire for their engines, but from a manufacturing perspective, we didn't think it would be the best solution. 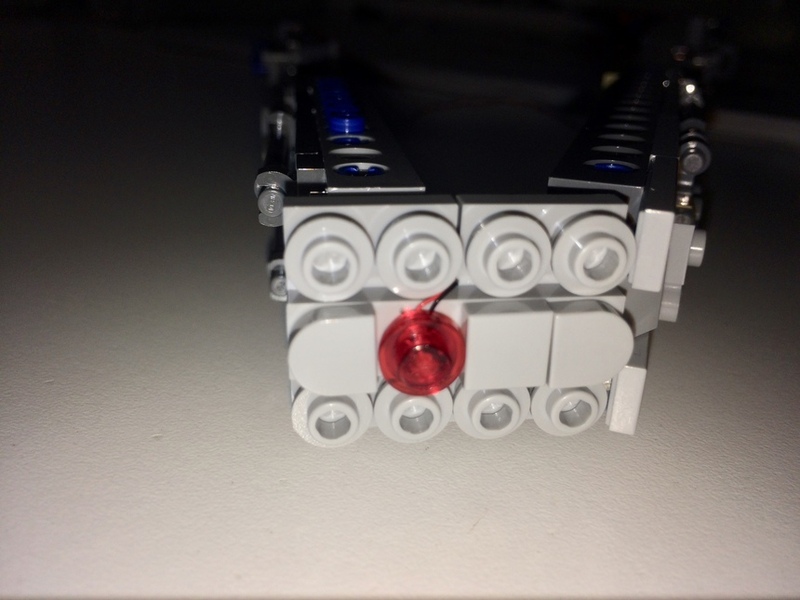 We are considering several other ideas for lighting the engines, and will post more information when we have it. Christian Nanini , keep up the great work, and if you think of things you wish we made or offered for the Falcon, please let us know! 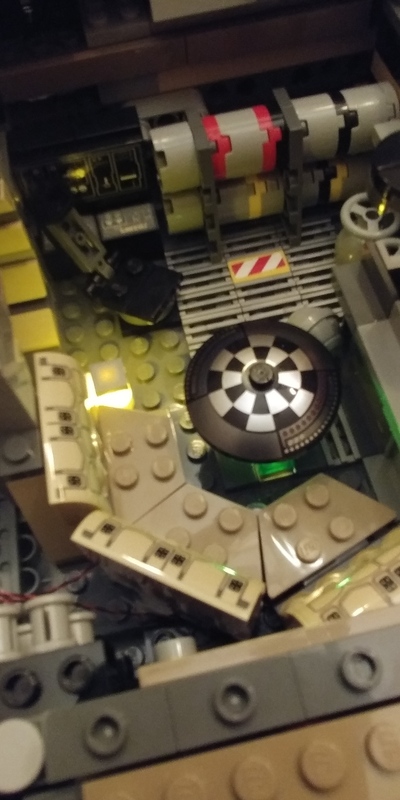 For example, we might be able to make a specialized remote control board that would allow you to fire the main laser cannons using the remote. And we are also considering selling a sound card to go with the kit-- what sounds would you want to have? Remember that we wouldn't be able to put any trademarked or copyrighted sounds onto a module. Again, thank you for sharing your great work! 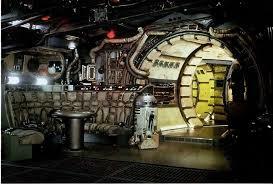 i think I am going to stick with the blue then for under the falcon. I was going to get the IR control and the IR remote but then, if you are going to make one for the set, I might as well wait until it’s out. I like the idea of a flashing red in the cockpit. I’ll see what kind of blocks are part of the cockpit. 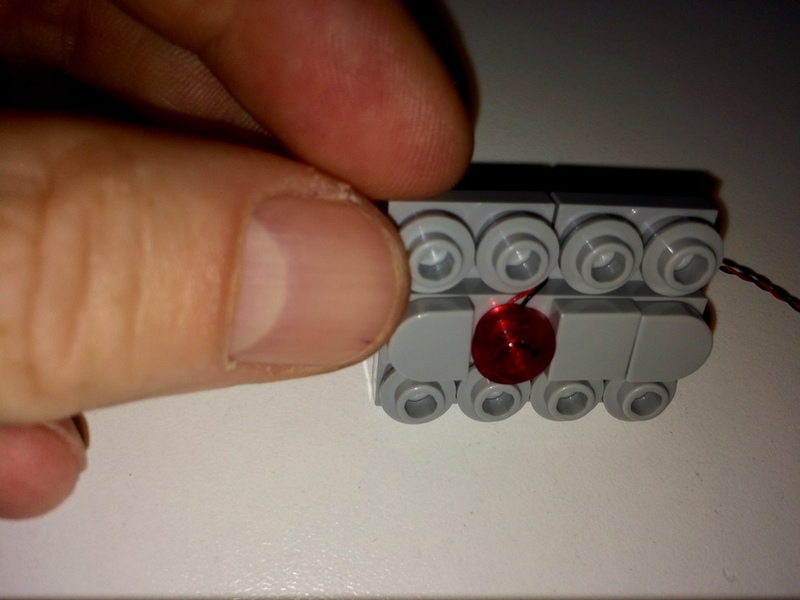 Worst case I can add a small round red brick translucent somewhere I’m sure. as for sounds card: one for the engine roaring, one for the canon , would be cool to have one for the light sabre duel and maybe one with Chewie roar!!! I second the comments on the great work Christian Nanini has been doing! 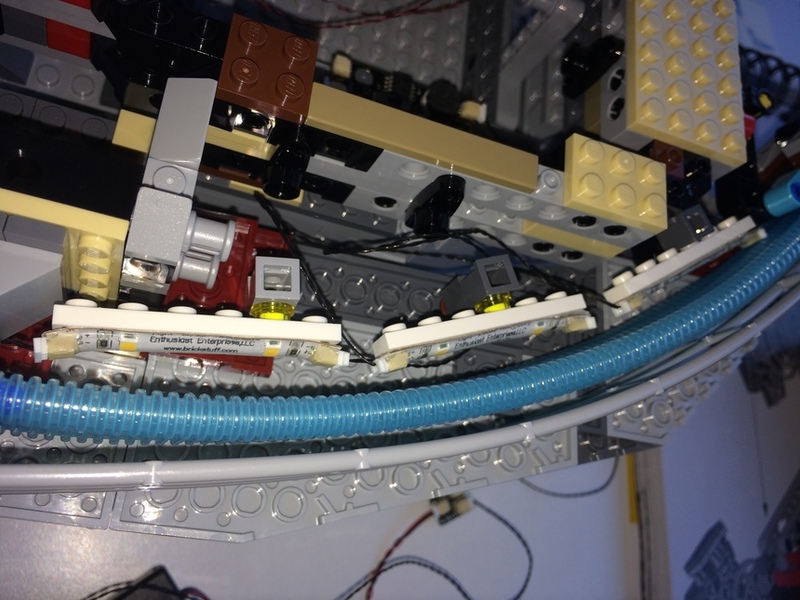 I've completed up through bags/step 13 of the build and so far have only installed individual cool white pico lights at the ends of blue engine tubes as that was one place (so far) that looked like it would be very hard to access after it was in place. I still have to dig out my battery pack and connectors to see how that looks. I'll post a photo once I do. I was pondering the idea of backlighting the tubes also and like how Christian has rigged that. 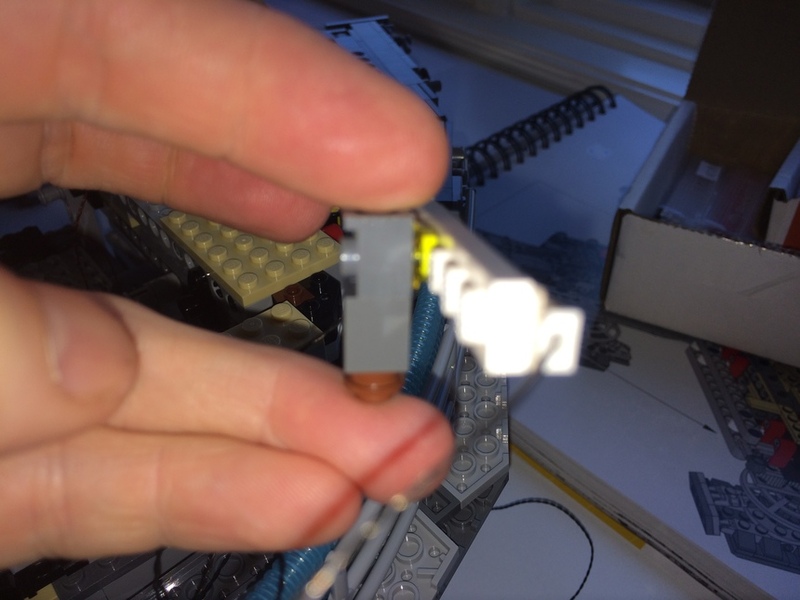 Laser cannon for exterior guns (and maybe the drop down gun if it possible to rig with enough slack but not be a pain to reload in the storage bay. Fortunately there is one whole unused section of the interior that looks perfect for mounting all the controllers, effect units, etc. (See screen shot of instruction below). 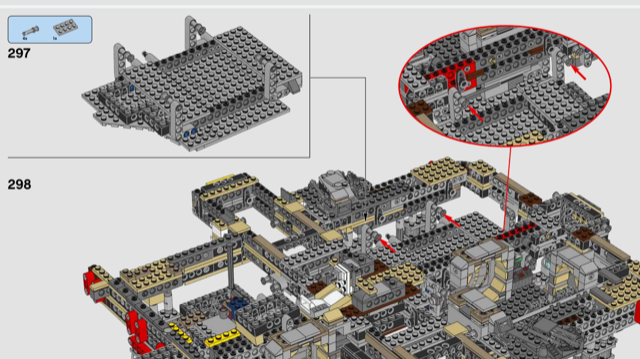 FYI Rob Klingberg the instructions are available for download as .pdf from the Lego site, even though the set is still listed as "Coming Soon" while they are catching up on back orders. 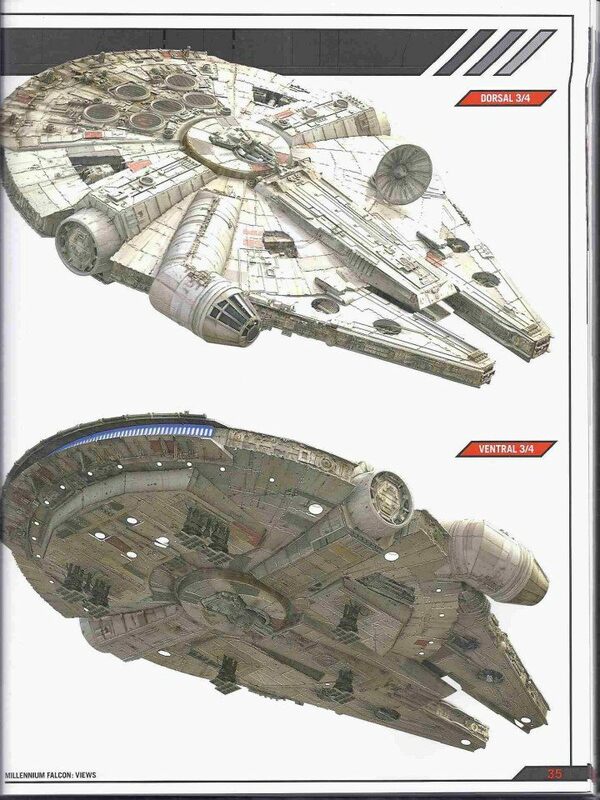 I've also been doing some visual research on the Falcon to look for additional lighting options. 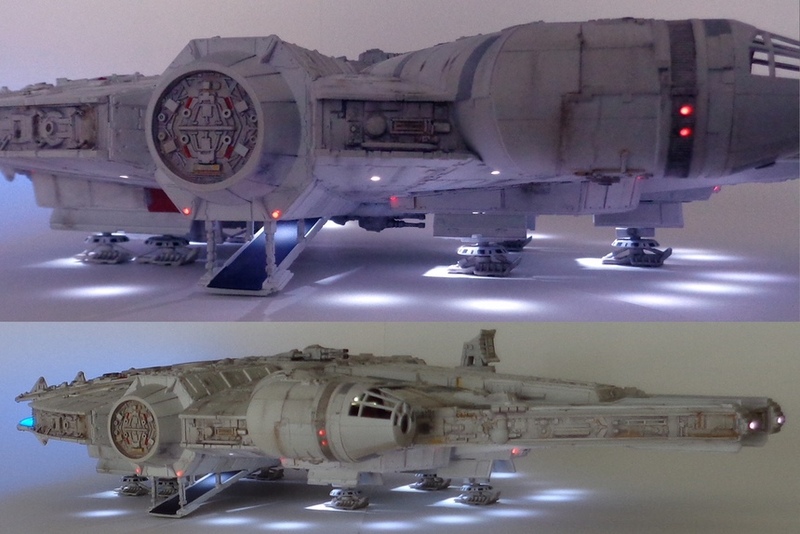 I've found some nice shots of landing lights and red accent lights on the exterior that I'll plan to add (see below). Also want to add some of the interior details I've found. I still need to re-watch the films to focus on any additional lighting details that can be added and check the accuracy of the images I have found. Adding sound effects would be great fun! 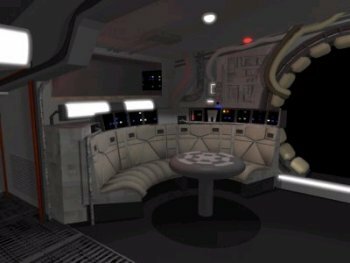 In addition to the ones Christian mentioned I would like: Hyperspace Leap, Luke's light saber training from Ep 4 (that's the scene I plan to stage in that room of ship, if everyone will fit - it's a bit tight! 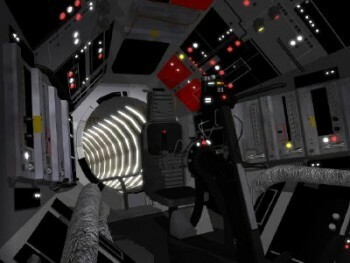 ), maybe some famous quotes "I have a bad feeling about this!" "That's no moon, it's a space station!"? The music from the entrance into the Death Star from Ep 4? More to come and I'll look forward to further posts from Christian as you continue your work! 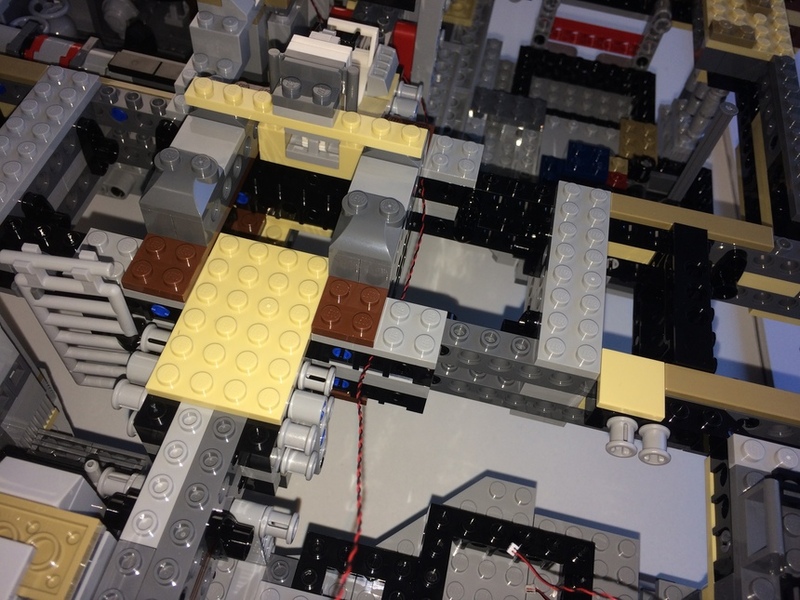 David Newell , i am only at bags #9 as I take my time to figure out where to hide the wire and put the lights. 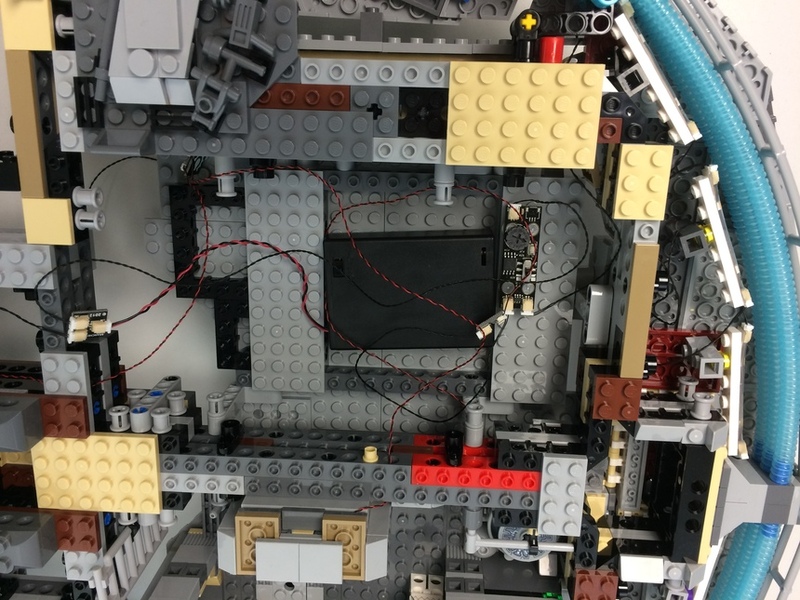 I agree with you, there are plenty of places to put the battery pack, USB cable, controller and 1:4 and 1:9 expansion adaptors as there are two big empty sections, the one you mention and the one right next to it, a bit more to the front. SEE pictures. And good idea to put the sensor for the Remote control in one of the 4 holes at top of the ship.. will try that when I am at that. How does the blinking/flashing controller works? 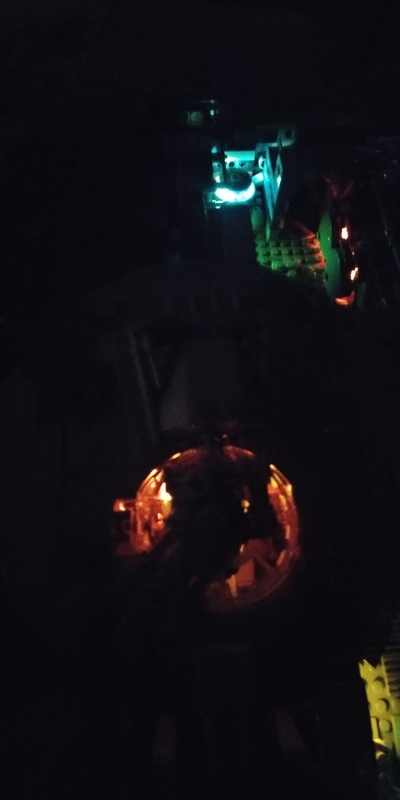 Example, if i want a few flashing LED in the cockpit that flash in a random matter, i I plug them in one of the output Flashing from the IR controller, will they all flash at the same time or will they all be random? Secondly, If i want to light up the canons at the top of the turret, there are 4, and would like the top 2 to flash then the bottom two, and go on in an alternate way, top/bottom...what is the best way to achieve that effect? question: using the single effect controller, when I use both output, does the effect alternate between each output, or the effect 'affect' each individual output? Work in progress. Happy with most everything except the engines. Keen eyes will also notice some custom modifications. One thing to note, turning down the brightness on a blinking led causes it to no longer blink. I'll have to break out the multimeter too see how to resolve this. Any tips Rob Klingberg ? thanks. Looks awesome. How did you light the cockpit? Looks like you added them on the wall behind? 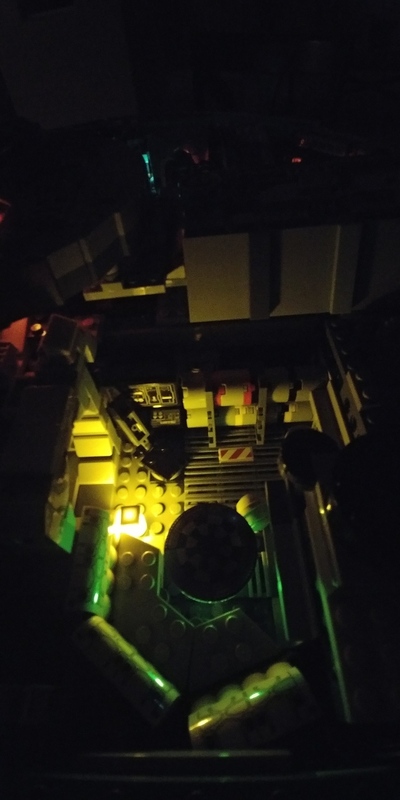 I was thinking at putting the lights on the floor and adding a couple of l Pico with the LEC blinky light effect to add to the command control. Did you see my video I posted with the engine at the back in action? I like the way is shows with the strip lights at the back of the noodle tube and the Jet Engine effect with the lights dimmed. It really looks nice. Good luck for the wall mount. I’ll do a coffee table with glass sides and glass top later in the winter. Christian Nanini Total of five lights in the cockpit. The two blue on each side (with the gray plate cover. A blinking orange in the back right (looking in). 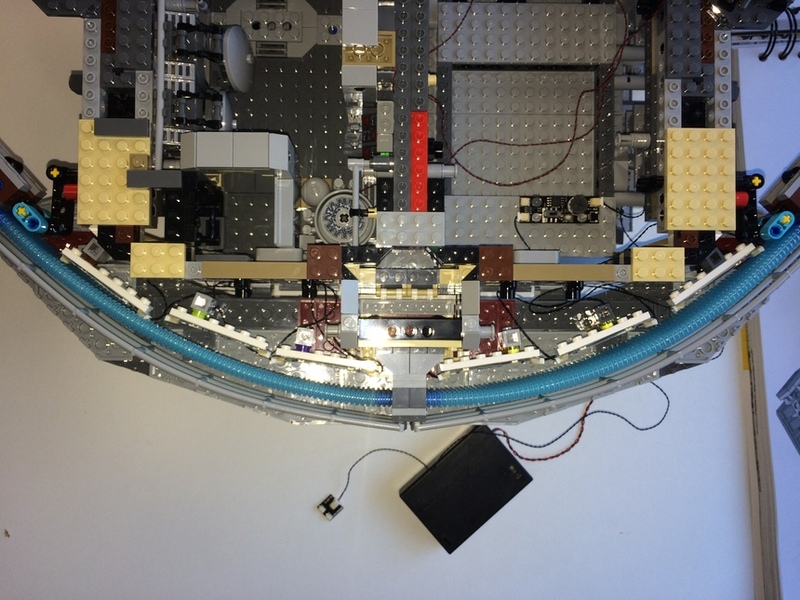 The last two are a yellow plate under center of the consil and then a blinking red of the under the far left of the concil. 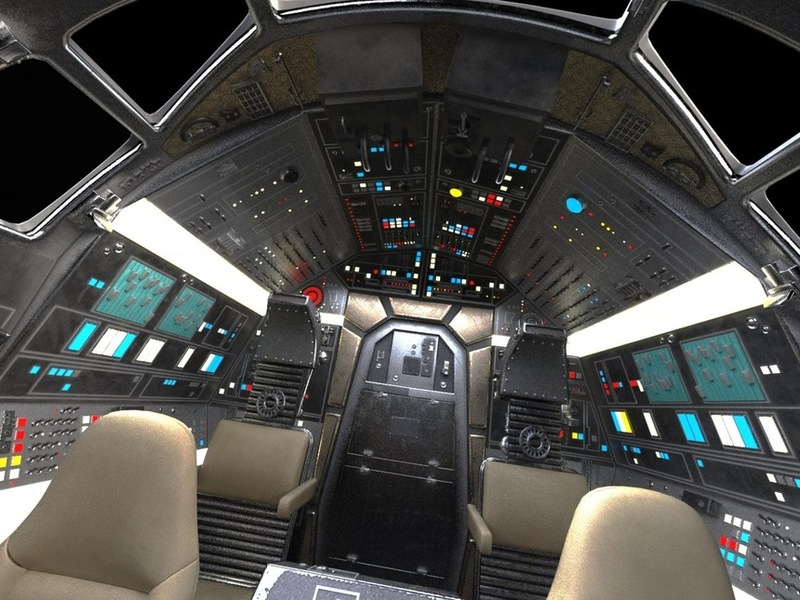 I may have to go the way of a separate LEC just for the cockpit blinking if I can't figure out how to dim them and still work. These all route in the cavities of the cockpit arm (it's the final bag, you will see when you get there). I'll check out your video now, but I don't intend to keep the engines as designed, so not too worried about lighting them right now. Brett Halper Great work, and thanks for sharing the photos! 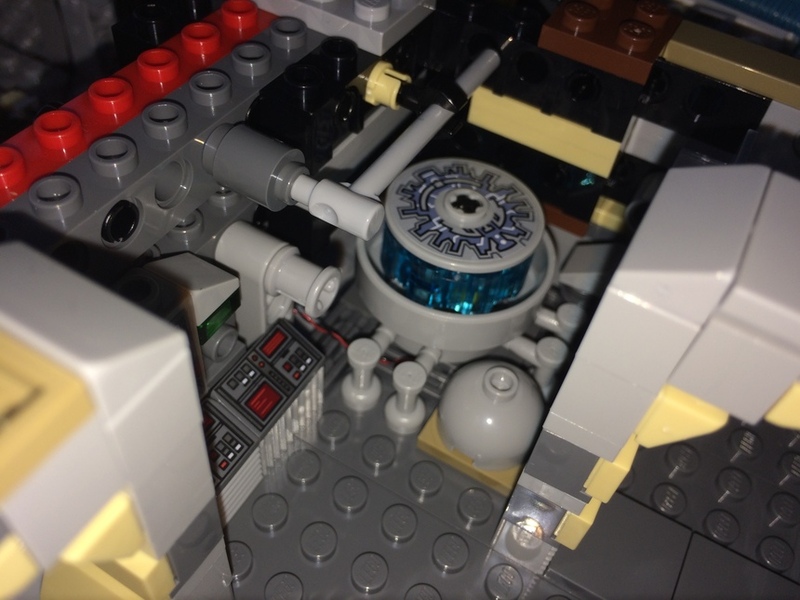 The internal blue light (hyperdrive?) is my favorite, and the cockpit also turned out really great. RE: the question about flashing LEDs not flashing when you dim them, since the flashing chip is inside the LED itself, my guess is that reducing the power to it (i.e., dimming) likely throws off the flashing chip onboard the LED. Also, if you're using the dimming function on the LEC, it uses pulse width modulation (PWM) to dim, which is actually many quick pulses of "full on" and "full off" so that's probably also confusing the chip. We do sell a true analog dimmer that adjusts the voltage (and doesn't use PWM), but with that, you might also get into the issue with a reduced voltage messing with the LED's flashing chip. 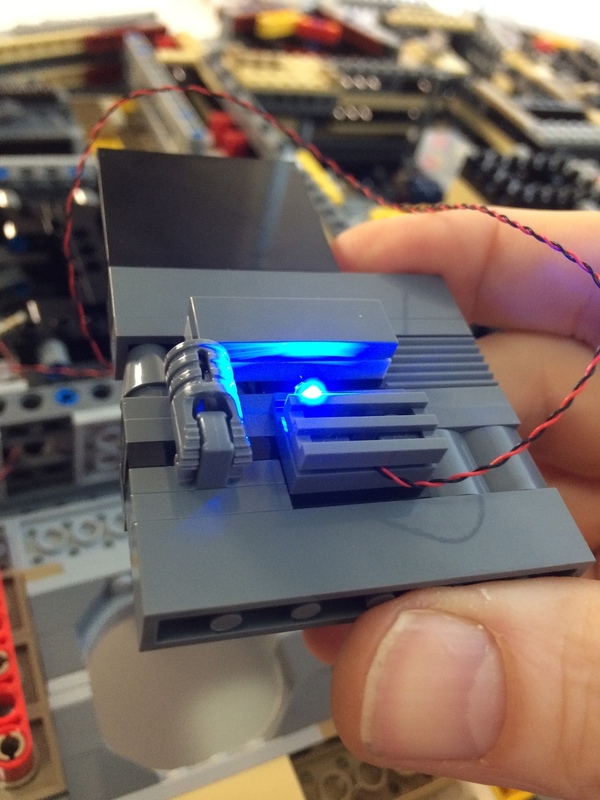 If you can spare one LEC channel for flashing, you can use the LEC itself to drive the flashing operation and use non-flashing Pico LEDs. With this, you can then also set the maximum brightness for all effects on the LEC, so you could pick a lower max brightness and it would maintain that for the flash. Hopefully this makes sense-- let me know if not. Christian Nanini Hi Christian, if you're looking for LEDs that randomly flash (like in a cockpit), you can use our Pico LEDs with built-in flashers. These flash at approximately the same speed, but over time they move in and out of phase, which creates a flashing effect that looks random. You can't control the speed of flashing in these Pico LEDs, and you can't get them to flash at the same time. If you want LEDs to flash in sync, you'd need to use the output of a lighting effect controller (LEC). 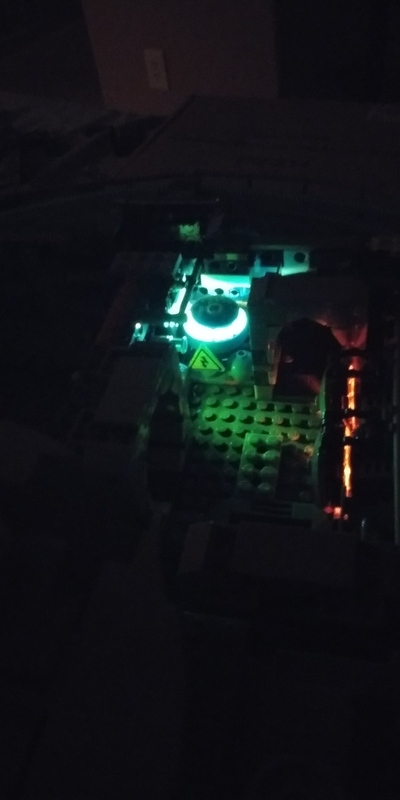 You are able to connect as many flashing Pico LEDs to one output of the IR receiver as you want-- this allows the flashing for all LEDs to be controlled by the IR receiver (flashing on or LEDs off). For the cannons, we have tested one of our 4-port micro effect controllers with the type of effect loaded that you describe (random firing of the two top LEDs followed by two bottom LEDs or vice versa). 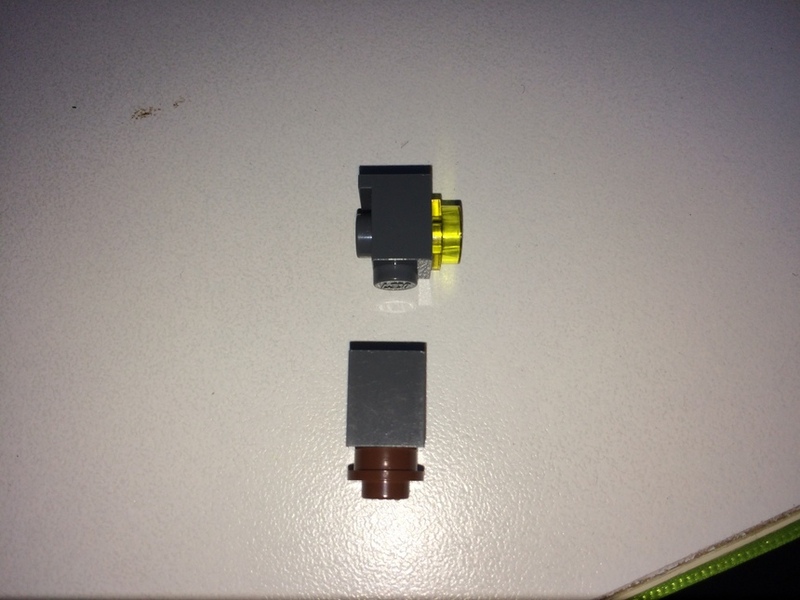 With the release of the new UCS Falcon, I think we will make this into a product we sell on our website. Stay tuned for more information about that. thanks rob. I already ordered my lights (it’s on it’s way!) 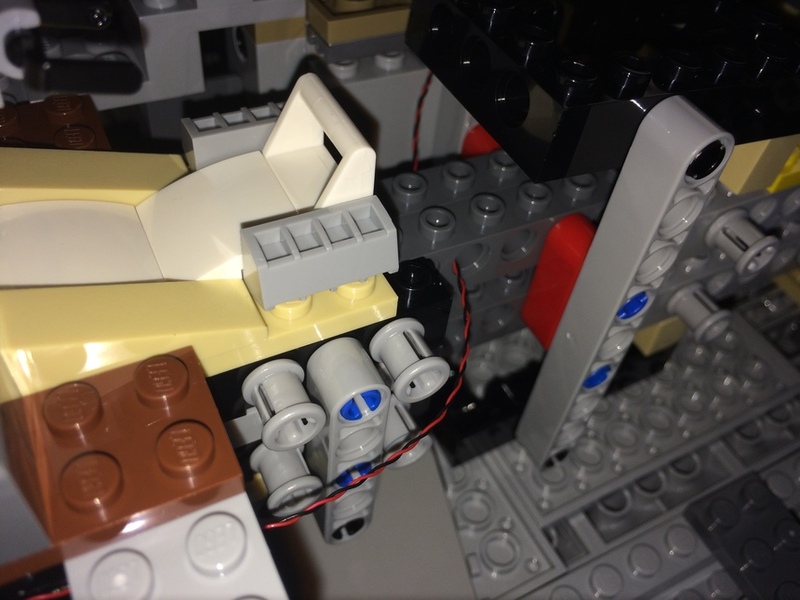 I got 2 more LEC, one on which I will use the Blinky light effect for all the blinking lights in the ship, and o will use the Cannon effect for the canon at the top. It should work pretty good. Rob Klingberg thanks for the great information! I think I'll try to just add a series resistor on the flashing leds to lower the current. 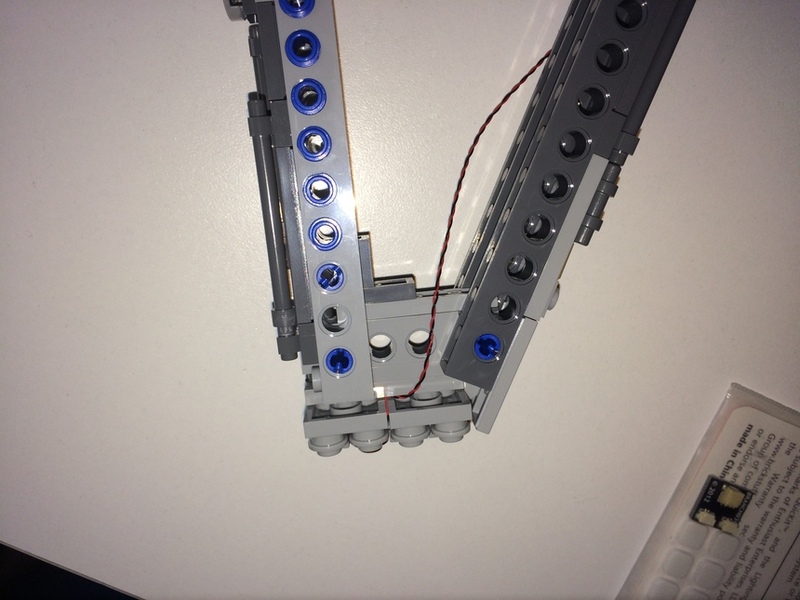 Alternatively, I can just add an in line voltage divider with a couple of resistors. Christian Nanini keep us updated on the cannon. I decided to not immediately pursue lights for this due to the complexity in routing the wires cleanly, but if you get the desired LEC output, I may have to break out the drill and add them.